Music is a multifaceted form of art with each part unique in its own way. One of the musical facets that the Venezuelan musician Gustavo Dudamel fits into is conducting operas. He is also an instrumentalist with his instrument of choice being the violin. The music genius serves as the music director of the Orquesta Sinfónica Simón Bolívar and the Los Angeles Philharmonic, Venezuelan-based and Los Angeles-based orchestras respectively. Here is a look at Dudamel’s rise to fame, as well as facts about some aspects of his personal life. As with most musicians who have attained the pinnacle of their careers, Gustavo Dudamel began his musical journey as a kid. He was born on the 26th of January 1981 to musically inclined parents who lived in Barquisimeto, Venezuela. His first music education was gotten from home as his father Oscar was a trombonist and his mother Solange (often called Sol) a voice teacher. Dudamel began taking formal music education from the age of 5 and it was soon clear to see that he was a wunderkind. Receiving his education from the best schools available (he was trained at El Sistema (simply “the system”), Venezuela’s best training program for kids) and mentorship from renowned names in classical music, Gustavo Dudamel, in a short while, became the talk of classical music. At the age of 10, he began learning to play the violin but soon discovered that conducting was his true calling. This discovery came in a somewhat joking manner. Dudamel, aged 11 had gone for his usual practice at El Sistema and when his tutor didn’t show up on time, he mounted the conductor’s podium and began leading his classmates who jokingly responded to his lead until things started to get serious and soon a magical crescendo was reached. His teacher who later came in watched on at the sides without announcing his presence. Impressed by his student’s performance, the teacher would later name Gustavo Dudamel as his assistant conductor. Fast forward to 1999, Dudamel came under the tutelage of the renowned José Antonio Abreu who in 1970 founded the prestigious El Sistema. Abreu would come to appoint Gustavo Dudamel as the music director of Simón Bolívar Youth Orchestra of Venezuela (Venezuela’s National Youth Orchestra). As he began touring around Europe with the orchestra, Dudamel immediately attracted attention from the big names in the classical music business. Gustavo Dudamel is easily the most decorated conductor of his time. He won his first conducting competition in 2004 – the inaugural Gustav Mahler Conducting Competition in Germany. The win can be said to be the breakthrough of his career as it brought him widespread recognition. Sweden, in 2006, made him the principal conductor of their national orchestra – the Gothenburg Symphony. Dudamel made his opera house debut performance in 2006, first at the Staatsoper in Berlin and then at the La Scala in Milan – two highly prestigious venues that he has since returned to perform. He has come to involve himself with a number of charitable deeds aimed at providing an opportunity for more children to be exposed to music. In addition to supporting El Sistema projects around Europe, Dudamel has spearheaded a couple of his own projects including the Youth Orchestra Los Angeles (YOLA) initiative in 2007 and the Gustavo Dudamel Foundation founded in 2012. Gustavo Dudamel’s most lucrative job seems to be his role as the music director of Los Angeles Philharmonic – which prides itself as one of the most financially stable orchestras in America. The orchestra records an average of $150 million in annual revenue. Dudamel is paid an annual salary of $3 million for his job. In addition to his other high-profile gigs, Dudamel’s net worth is estimated at $10 million. He paid about $2.8 million for his house in Los Feliz. Gustavo Dudamel is married to María Valverde, a Spanish actress who began her career at the age of 16. She got her big break in the film, La Flaqueza del Bolchevique. The bi-lingual actress has also starred in a number of English films. She met Dudamel in 2016 and a year later, in 2017, they were married. 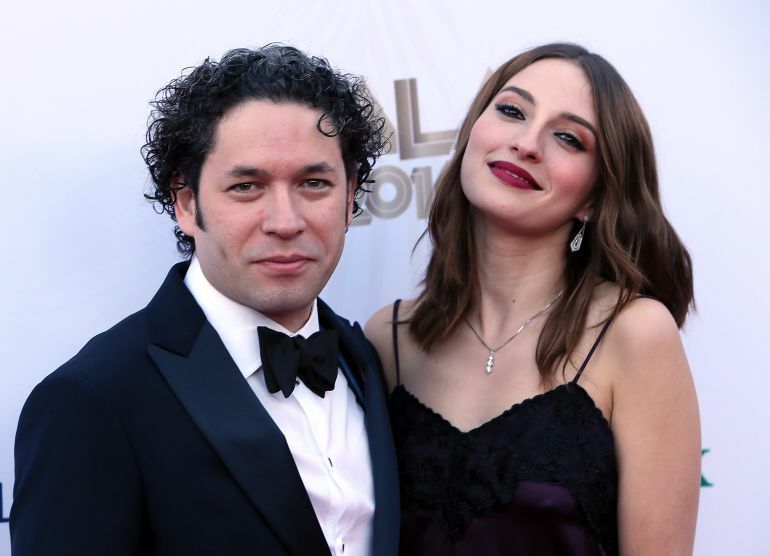 The marriage was Dudamel’s second as he had been previously married to Venezuelan actress, journalist and trained ballet dancer Eloísa Maturén whom he divorced in March 2015. They wedded in 2006, bringing the lifespan of their union to 9 years. Together, the former couple had a son named Martín Dudamel Maturén. A good height is a great fit for anyone who has a job that requires that they stand on a podium, however, Gustavo Dudamel wasn’t lucky enough to be blessed with such height. Nevertheless, that has done little to mar his outstanding talent. The conductor stands at just a few inches taller than 5 feet.